UPDATE 26 March 2015: Ian Stirling has added his expert comment on this incident, see below. UPDATE 28 March 2015: Newfoundland’s Director of Wildlife has commented on this incident, see below. 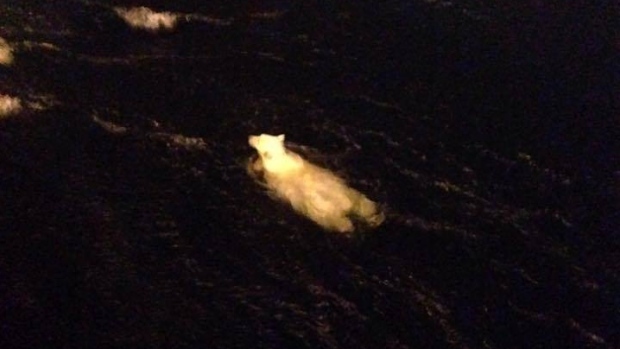 “Crew aboard the offshore supply vessel Atlantic Merlin got quite the surprise early Monday when they spotted a polar bear in the water not far from Hibernia. The massive oil platform is located in the Atlantic Ocean some 315 kilometres east-southeast of St. John’s. Sources say the bear was swimming far from any sea ice. It attempted to climb aboard the 600,000-tonne gravity base structure. Margot Bruce-O’Connell, spokesperson for Hibernia’s majority owner ExxonMobil Canada, said one and possibly two bears were spotted in the area near Hibernia and the West Aquarius drill rig over the past few days. Looking at the Canadian Ice Service map I copied above, makes me wonder who their “sources” were. Read the whole story here. “Ian Stirling, an adjunct professor at the University of Alberta, said at this time of year, there are large numbers of harp and hooded seals offshore, and sometimes polar bears will leave sea ice in pursuit of their favourite prey. Stirling said often the animals lose track of where they are. “I think this is probably a fairly regular event. It’s not as common to actually see them,” he told the St. John’s Morning Show. 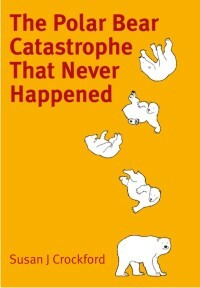 Stirling said polar bears start to feed on harp seals offshore and there are hundreds of thousands of them. “Some of the bears get out there — and they’ve never had it so good. And they [the seals] don’t run away like a ring seal. But what they don’t notice is that sometimes the ice, with a bit of wind, is blown out and goes out to Davis Strait — and all of a sudden they’re far away from anywhere,” he said. “It’s well-known that animals can swim on average long swims, 150 kilometres is what that they can handle. I think it’s touch-and-go even if he went in a straight line, whether he’ll be able to make it back to land at some point,” said Stirling. “If he could see the platform from a distance, he would have gone over to it to check it out as a place to climb out. That’s what they do all over the Arctic,” he said. There’s more — read the rest here. Sidebar Stirling quote enlarged in March 25, 2015 CBC article. “The province’s Director of Wildlife says polar bears spotted near the Hibernia platform last week may not necessarily be in trouble. 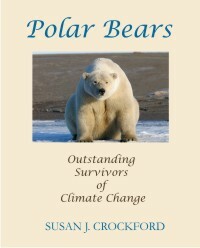 John Blake says polar bears are extremely strong and well-adapted swimmers and can cover some very large areas. He says the bears need an ice platform to hunt from, and there’s plenty of ice off the coast of Newfoundland and Labrador this year. Blake says while it’s not common to see a polar bear that far offshore, the animals should have little trouble getting back to ice or land. 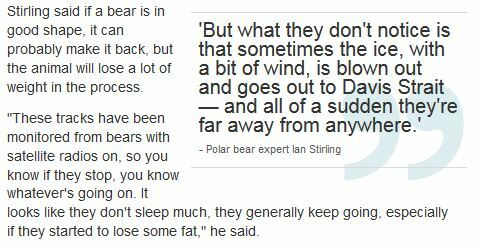 Regarding distances that polar bears are able to swim (i.e., reference to “recent studies”), I have copied below my “Featured Quote” #38. Turns out “several hundred kilometers” was a maximum of almost 700 km (by a mother and yearly cub). “…most of the long-distance swimming events that we identified involved bears swimming from unconsolidated sea ice to the main pack ice or to land.” Pagano et al. (2012). 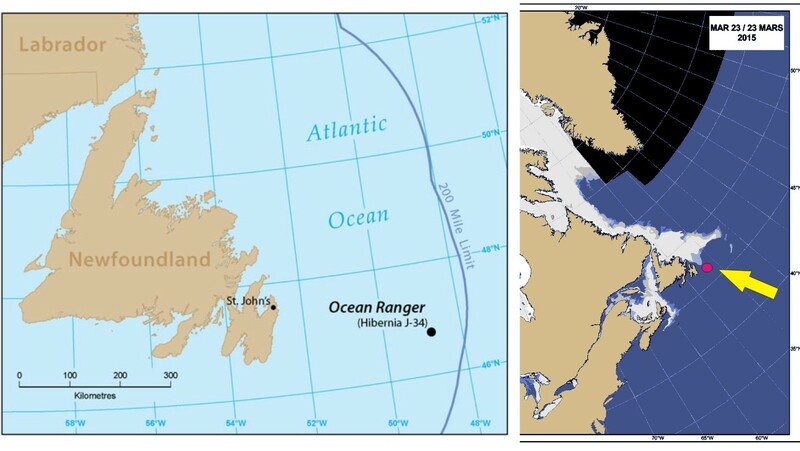 “Pagano and colleagues calculated the mean distance between the mainland coast and the sea ice edge at the end of September for each year of the study period. This distance varied from a low of about 200 km (achieved in 2005, 2006, and 2009) and a high of about 430 km (achieved in 2008). Mean distance from the shore to the ice in 2004 was about 300 km and in 2007, it was about 380 km. Each of these measurements varied somewhat depending on the configuration of the shoreline, but in 2008 the ice edge was definitely the furthest away than in all other years back to 1979. However, the largest number of long-distance swimming events took place in 2009, when the ice edge in this region was about the same distance offshore as in 2005 and 2006. See the entire NIPCC summary here. 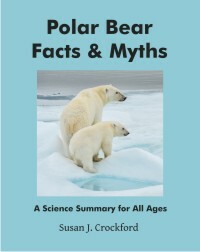 This entry was posted in Life History, Sea ice habitat and tagged Davis Strait, Hibernia, Newfoundland, oil platform, Pagano, polar bear, sea ice, sea ice maximum, swimming. Bookmark the permalink.